We at Golf Pro Delivered have spent hundreds and even thousands of hours learning how to play the game, how to learn the rules of the game, how to learn the etiquette of the game, how to read greens, how to judge the wind, how to recognize hazards, and how to teach others the game as best we can. We are the authors of the phrase “The Five Minute Golf Lesson” and “The 5 Minute Golf Lesson” as you will see when you type in this phrase on google WITH QUOTATION MARKS AROUND THE PHRASE. (this means that google will only pull up websites and articles on the web that use exactly these words in exactly this order). In 2018, we at Golf Pro Delivered became the authors of the phrase “The Five Minute Golf Lesson.” No one had ever written this phrase, with either the word “five” or “5” in this phrase. This is because we are in the mobile golf simulator with Foresight golf technology, and the golf event business, where we often have 10-20 people standing in line to hit balls in our simulator, putt on our “putting greens,” chip in our chipping areas, and hit into our golf nets. Since we are up at one location for only a part of a day, a full day or maybe three or four straight days, we want to get everyone to be able to hit in our simulators with our large screens showing where the ball would go if it were outdoors. So, we give a lot of five minute golf lessons. Our lessons are not designed to ever take the place of a more substantial golf lesson. We are PGA golf members and we want to expand the game so every PGA member who wants to give lessons does give more lessons. However, we work hard in our short period of time, which is five to thirty minutes per person, to help that person improve as much as possible, learn things about golf they can remember and retain, and actually love their experience hitting golf balls. I wrote the phrase, “The Five Minute Golf Lesson” on the internet as the subject of Golf Pro Delivered writings (and was the first person in the history of the internet to use this exact phrase), without knowing that the PGA in 1998 started a program called “PGA Free Lesson Month” and in 2010 PGA members gave 73,750 free [ten minute] lessons… [and] 19,175 were given to new golfers. See: http://www.georgiapga.com/popup/article_pga10010/ Clearly, the article by the Minnesota Section of the PGA is a result of the PGA’s Free Lesson Month which asked PGA pros in May of each year to give some free ten minute golf lessons. We thank the Minnesota Section of the PGA for writing this 2013 excellent blog entry and for granting us the permission to reprint it here. 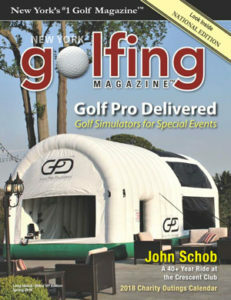 Further, we want to thank the Minnesota and Georgia Sections of the PGA for their writing about the Free Lesson Month Progam, and for all of the great work the Minnesota and Georgia Sections of the PGA do for the game of golf. Ten minutes. That’s all the time is takes for you to improve your golf game. No, it’s not an infomercial product, it’s a simple golf lesson! Whether you’ve been golfing for three months or 30 years, a one-on-one lesson can benefit anyone hoping to fix their swing, stance and those tricky shots golfers always face on the course. How to get your backswing in sync. 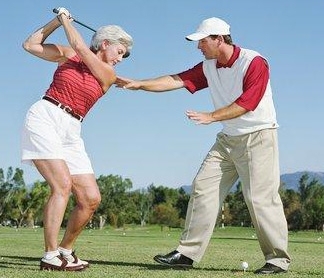 Timing is everything, ask your PGA professional what drills he/she recommends to help you get your swing in rhythm. How to improve your tempo to add distance. It’s the old axiom, don’t swing harder, just improve your tempo. How to know if your swing is one or two-plane. Huh? Think of it this way, have you ever seen Jim Furyk’s swing? Think two-plane with him. How to use distance control to avoid three-putts. The dreaded three putt will sink a round. Get in the habit of shortening your backswing. How to read breaking putts from grain and slope. A great putt starts with a great read. Make sure you know what to look for on a green. How to align your ball to be a more accurate putter. Do you use visual cues to help determine the proper line? How to switch your focus from line to speed before you putt. You think you know where to hit the ball, but do you know how hard to hit it? How to “bounce” your wedge through the sand. Not all sand shots are created equal, work with a golf professional to understand the differences. How to hit high, soft sand shots to tight pins. It’s all about loft and lie, isn’t it? But how do you know how to hit that high hanging sand shot? How to hit the tricky long bunker shot. Two inches behind the ball, right? Not necessarily in this case, but a quick lesson will help you get out of the sand. Who knew! You can learn how to tackle these tips and tricks in only ten minutes? Just think about what you can learn in a twenty minute golf lesson. We doubt that anyone can learn all or more than one, or maybe two at the most, of these ten essential golf skills very well in just one ten minute golf lesson, especially if the student is a beginner. However, we do believe a golfer, beginning or seasoned, could likely improve in any one of these areas by taking a ten minute golf lesson given by a qualified golf professional, provided that the golfer was very, very keen on improving significantly in this one area. Of course, to really master any one of these important golf skill areas, after that ten minute golf lesson filled with useful information, great examples by the golf professional, and diligent work by the student during the lesson, the student would have to work for a significant amount of time at mastering any one of these areas, much two of them or all of them. In fact, after thousands of rounds of golf, passing the Player’s Ability Test of the PGA at age 65, and winning my first “city-wide” golf tournament in 1967, 51 years ago, I still have trouble using the “bounce” of my wedge as well as I would like to in the sand trap. Thanks again to the Minnesota PGA for this great and timely blog entry.